I like my toad served with creamy mash and steamed spring greens but for ease roast some skin on chunks of potato on the top shelf while you prepare the batter giving them a head start and then move them down when you whack in the toad, serve along with peas and an easy gravy. Preheat the oven gas 8 / 230*c.
Add the oil to a non-stick roasting tin and place in the oven to get really hot, approx 3 - 4 minutes. Meanwhile - Whisk all the batter ingredients together until smooth and season well – set aside. Put the tin back in the oven and cook the sausages for 5 minutes to brown. Pour over the batter mix and cook for a further 25 - 30 minutes on the top shelf until the Yorkshire pudding has risen and turned golden. Turn the oven down to gas 6 / 210*c, move the toad to the middle shelf and cook for a further 5 minutes to dry and set the pudding. *Using an extra egg white makes the pudding lighter, rise well and generally soufflé like. TIP- Rest –The flour proteins in the batter like a little rest before cooking, if you get time set it aside for 20 minutes. NO toads were harmed in the making of my dish. Apparently toads were never used, what a relief! Batter pudding goes back to roman days and many an old cook book with offer up a recipe for batter puddings in a sweet capacity served with jam. Clafutis is a French recipe obviously stolen from us! Consisting of fruit baked in a batter. Up North where my husbands from they serve Yorkshire puddings as a starter with onion gravy, while my parents used to have left over ones with jam when they were little. 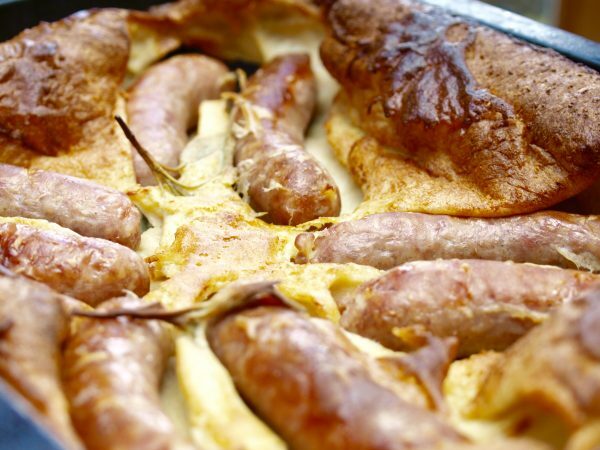 A variation of toad in the hole is frog in the hole using lamb chops. And last of all for added tastiness you could add small dice onion, mustard, chopped herbs, horseradish, roasted peppers or even bacon to your batter mix.